Many scenery and aircraft objects contain some conditional code. For example a bit of the object that is only shown when certain conditions are met. To be able to process such conditions on import of pre-FSX objects MCX needs to know what the value of the variables in these conditions is. So when such conditions are found in the object, you will get a form where you can enter the value of the variables found in the object. See screenshot of this form you can see below. AlwaysTrue: the value of the variable is not checked, the condition is always true. AlwaysFalse: the value of the variable is not checked, the condition is always false. 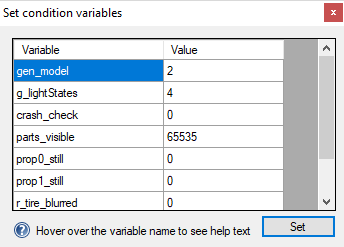 VisibilityCondition: the value of the variable is not checked, a FSX style visibility is made and used to represent the condition. 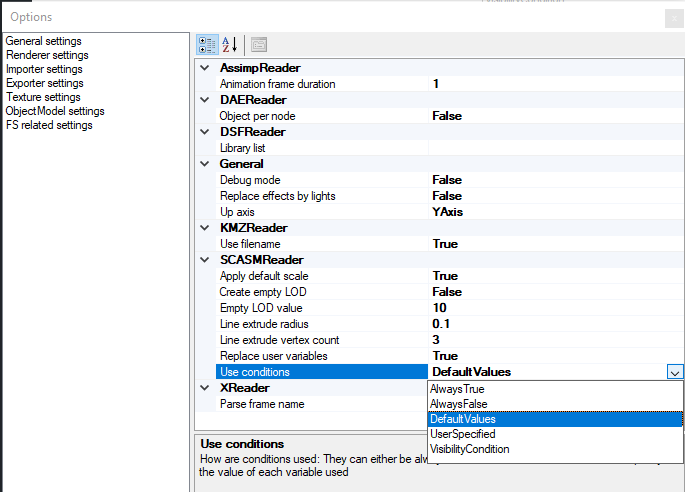 UserSpecified: the form mentioned above is shown where the user can enter the values of the variables. Then using these values it is checked if the condition is true or false. DefaultValues (new): This one works like UserSpecified, but instead of showing the form it uses the default values for the different variables. This are the values that are shown in the form initially as well.